Georges Seurat may not have been as well-known to the general public as representatives of impressionism, but he entered the history of world culture as the founder of neo-impressionism, and he also invented his color transfer technique in paintings, which was called pointillism or divisionism. The main feature of pointillism is the dotted application of paints of a special, identical form. In his specific style, Seurat and the picture “The White Dog” of 1885 were executed; the work was done on a tree in the style of post-impressionism. In the picture, the French artist-innovator depicted a sunny summer day in a park on the bank of the river, where people relax, they communicate there, walk their dogs, admire the horizon. The story of the painting is very curious, because it got its name because of the dog, which is visible in the upper left part of the canvas, paradoxically, the dog had no original picture, the artist added it later. The park itself and the angle from which the picture was painted very much resembles another, more famous Seurat’s work “Sunday on the island of Grand-Zhatt”, created a year earlier. At exhibitions, Seurat was sometimes impossible to see because of the crowds of people who gathered near his paintings. The work “White Dog”, is part of a great scientific achievement of the artist in the field of painting. The viewer is attracted by both the pictures themselves and the technique used by the author. 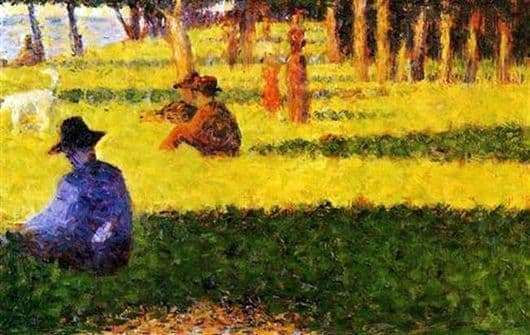 To achieve such results, Seurat studied the works of Chevrel, Ore, and Blanc on color theory; he successfully used this knowledge in practice. Despite the fact that Georges Seru lived only 32 years, he will forever remain in history as the founder of a new direction in painting, which certainly influenced the work of the next generation of artists.